This is the back story to the book Shingijutsu-Kaizen. In 2007 or 2008, a book project was initiated to write about the method used by sensei from Shingijutsu USA Corporation to teach kaizen. A manuscript was produced, but the project was abandoned. Several months after my work had commenced on the book Kaizen Forever, I asked for and obtained a copy of the manuscript. I read it and saw a gem that needed some polishing. So, in January 2015, I decided to edit the manuscript and bring a good product closer to Shingijutsu’s unique way of thinking. I did this on my own initiative because I had some time available during my university’s winter break and thought it would be a fun challenge. I deleted 50-plus pages (principally, all the stuff related to organizational behavior, organizational development, and Western views of leadership and change management – none of which made any sense to Nakao-san), made many corrections, and wrote sentences, paragraphs, and pages to smooth the transitions caused by heavy editing. I changed the book title, changed some of the section and chapter titles, changed the font, re-formatted the manuscript, added images, created the book cover, and so on. While this manuscript revival project was independent of Shingijutsu USA Corporation, I and my co-authors felt it necessary to ask Shingijutsu kaizen consultants to review the new manuscript. They did, and loved it! But, the manuscript needed more work. I continued to work on the manuscript over the next several months in collaboration with my co-authors. As the project neared completion, we again asked the Shingijutsu kaizen consultants to review the manuscript. They agreed, and suggested a handful of small changes to better reflect Shingijutsu’s way of thinking. 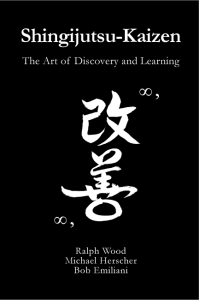 The resulting book, Shingijutsu-Kaizen: The Art of Discovery and Learning, informs readers of a practice that people have long misunderstood or even forgotten about, but which is critical to creating flow and “becoming Lean.” People have been convinced that they need to know and use various new Lean tools that are actually not necessary. The Lean sales and marketing machine has been very successful at changing the world by diverting people’s attention from kaizen to other, far less important tools and methods. Kaizen IS the change management process for “becoming Lean.” Therefore, you should listen to and learn from the masters of kaizen, Shingijutsu, before anyone else. Unfortunately, there is much variation in how kaizen is understood and facilitated. Shingijutsu-Kaizen is the premier form of kaizen – the standard by which all other kaizen is judged. Shingijutsu-Kaizen, as well as the book Kaizen Forever, are more essential for understanding and “becoming Lean” than practically anything else you can read. While reading and converting the learning into daily practice can take you far, you will go much further, faster, with hands-on help from the masters of kaizen. For proof of that, read Better Thinking, Better Results, the story about The Wiremold Company’s Lean transformation, and Transforming Health Care, the story about Virginia Mason Medical Center’s Lean transformation, in which Shingijutsu-Kaizen played a critically important role. Hire Shingijutsu USA Corporation to lead kaizen in your organization. You must take advantage of the opportunity to learn from the masters. Hi Bob – OMG, when I saw the title including the term “Shingijutsu” I couldn’t believe it. This is my expertise in the Lean Thinking Philosophies as you know. I studied and practiced and taught Shingijutsu Lean Philosophies. All of my first instructors came right from Taiichi Ohno’s school of “Lean” in Japan. Shingijutsu Lean Philosophies which include Kaizen is what every other single “Lean” version is based upon. Shingijutsu Lean was born from the TPS (Toyota Production System) under the direction of the Father of Lean Thinking, Taiichi Ohno. It is about time that someone finally brought Shingijutsu out of the closet. I can’t wait to read this book. Bob F. Butler: Instructor: Lean Thinking Philosophies. Excellent; I’m sure you will like the book. More to come (maybe).